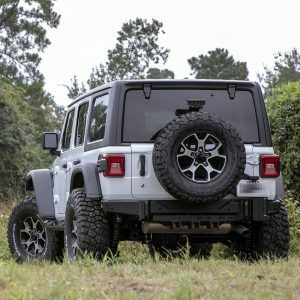 The ROAM JL Slimline Front Bumper (Jeep Wrangler JL Slimline Front Bumper – Winch Mount): Ultimate/Max approach angles, mixed 3/16″ and 1/4″ high strength steel construction, integrated full size winch mount, and an integrated front mini-skid plate. 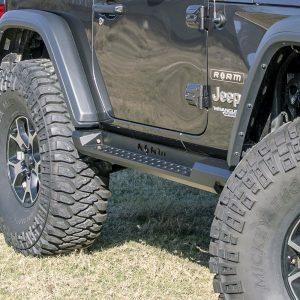 Laser cut and fully seam welded for ultimate strength and front crash protection, the ROAM JL Front Bumper also integrates a bull bar grille guard and is 2 stage textured poly powdercoated for surface durability. Exceeds all OE specifications for resistance to the elements. Made with pride in the U. S. of A. 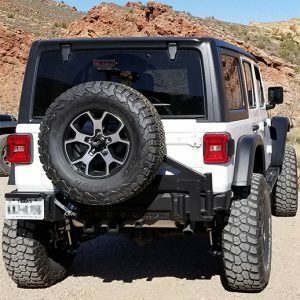 Integrated full size winch mount. Fits most winches rated between 8000-12,500 lbs (Warn VR-8 Recommended). 1/2″ steel chassis-mounted Recovery Points. Compatible with Hi-lift Jacks. Integrated Front Mini-Skid Plate. Clears 4X.X” tires by itself. Powdercoated for durability! (2 Stage Poly). No welding, drilling, or cutting is required for installation. Designed and Made in the U. S. of A.